Desk cords all over the place? Check out this video by Nifty. Cut a shipping tube into the size that will fit under your desk. Cut the tube open lengthwise, and stretch it open so the crack sits open about 2 inches wide. Tape over all the sides to give a clean look. Spray paint it the color of your choice. Once dry, screw the tube into the back underside of the desk, (two screws is fine) so the crack sits open facing towards you. Push a power strip into the tube, and plug it in. Plug in all items on your desk into the power strip, and tuck the extra cord into the tube. 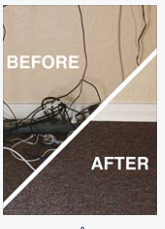 The power strip will now be the only cord showing from the desk.Enjoy a clean floor!